Hitting the Streets for Science: What Motivates Protest Behavior? This past weekend tens of thousands of people participated in science marches in more than 600 cities around the world. Scientists on all seven continents — even Antarctica – participated in the protest. And, as it turns out, scientists aren’t unusual in this regard. According to the World Values Survey, fewer than one in five citizens of North America, Western Europe, Australia, and New Zealand report having participated in a political demonstration; more than a third say they would “never” do so. So what are the circumstances that get people engaged in protests like the March for Science? In a recent article in Current Directions in Psychological Science, an international team of researchers from the United States, Germany, and New Zealand analyzed the key factors that spark the motivation for political protest. “Given the extent of inequality and unfairness in the world, it is surprising how few people actually protest,” authors John T. Jost, Julia Becker, Danny Osborne, and Vivienne Badaan write. Social-psychological models of collective action have identified three key antecedents of protest: anger at perceived injustice, social identification, and beliefs about group efficacy. That is, “collective action is more likely when people have shared interests, feel relatively deprived, are angry, believe they can make a difference, and strongly identify with relevant social groups,” Jost and co-authors explain. However, these models rarely account for ideological factors that might motivate – or prevent – people from engaging in protests. People’s emotions are directed not only at individuals and groups but also at larger social systems. According to system-justification theory, most people are motivated to justify and defend the social, economic, and political systems on which they depend – even when these systems may be unfair or unjust. Protests occur in contexts where people are motivated to defend this structural status quo, or when they’re motivated to challenge and oppose it. Jost and colleagues note that system justification can also undermine willingness to protest, even among political activists. For instance, May Day protestors in Greece primed with a system-justifying stereotype exhibited less anger and less willingness to protest compared to a control group of protestors. In another study, members of a British teachers’ union primed with a system-rejecting mind-set scored lower on system justification and exhibited more anger at the government and more willingness to protest than those assigned to a control condition. The effect of system justification on willingness to engage in non-disruptive protest — writing letters, signing petitions, attending meetings, and distributing leaflets — was also mediated by a reduction in anger toward the government. 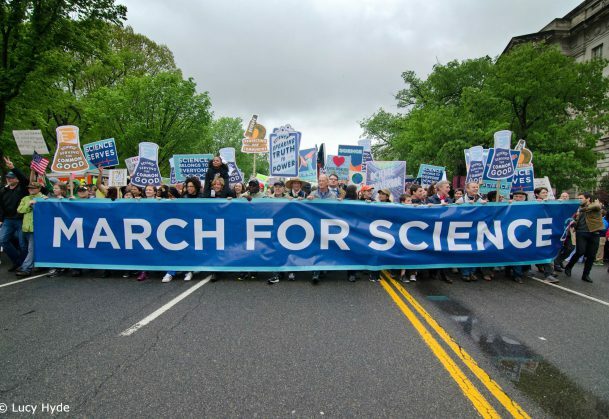 It’s impossible to know whether governments will change their tune on the importance of science, but one result of the marches may be an increased enthusiasm for protest among March for Science participants. “[T]here is evidence that after participating in a single protest event, people come to think of themselves as the kind of person who protests against certain kinds of injustices, and this makes them more likely to participate in protest later,” Jost said. John T. Jost will be part of a symposium honoring 2016 William James Fellow Award recipient Mahzarin Banaji at the 29th APS Annual Convention being held May 25-28 in Boston, USA. Publications > Observer > Observations > Hitting the Streets for Science: What Motivates Protest Behavior?